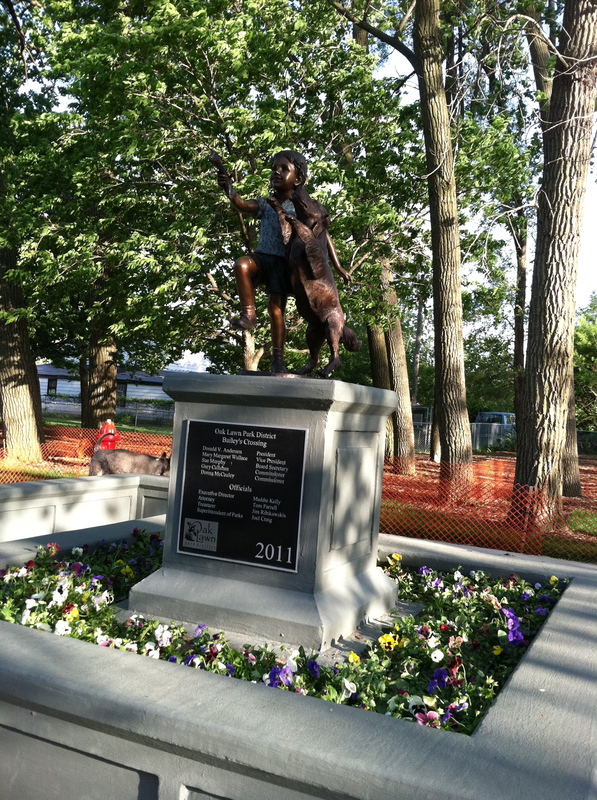 A few weeks back, Oak Lawn opened its very first dog park. Obviously, Frasier and I attended, and despite some questionable policies, I think I can safely say there will be many visits in the future. There’s plenty of open grass space to roam around in, a water fountain for both the dogs and the humans, plenty of seating, free poop bags, and of course it’s all completely fenced in. But the best part? Watching all of the dogs interact with one another. So far, each time we’ve gone, every dog (and most of the people too) have been friendly and polite. And even though Frasier chooses to ignore the other dogs in favor of exploring on his own, while peeing over every square inch of the place, it’s still a good time for all. 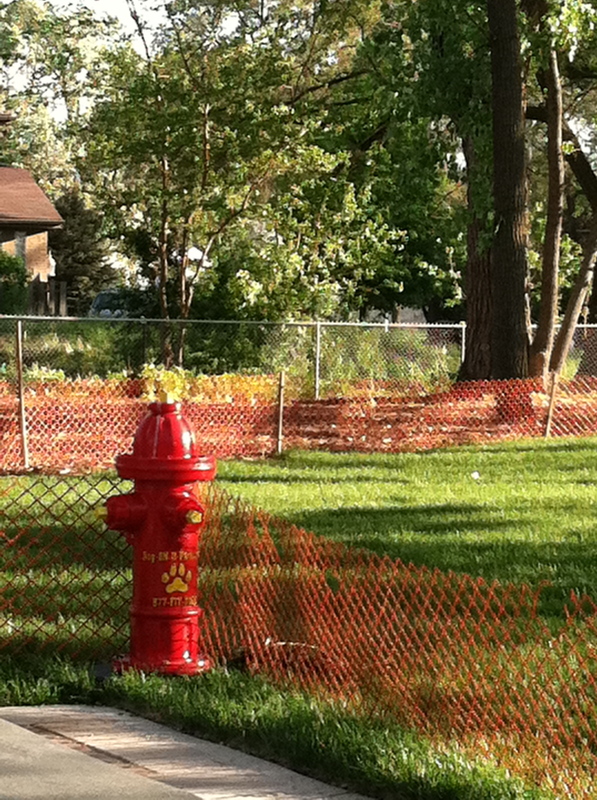 Yes, those hydrants are purely decorative. Yes, Frasier peed on all of them. 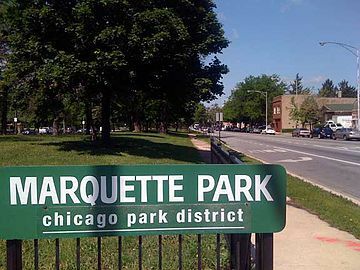 Last week, a co-worker asked if I wanted to share a garden plot with her at Marquette Park, on Chicago’s Southwest side. 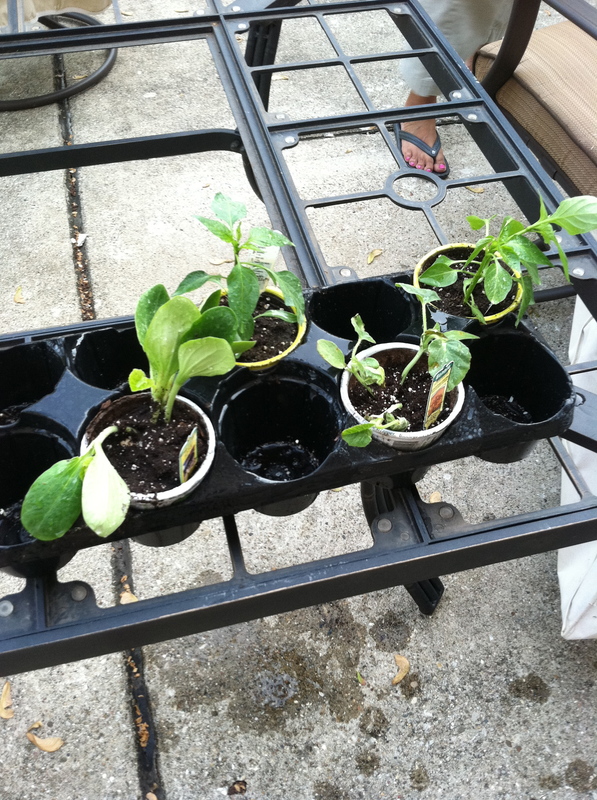 While I kind of hate dirt and have no experience whatsoever in gardening, it sounded like a fun idea. So on Saturday, in return for helping her weed her own yard, my mom carefully picked out some plants for me to grow. Armed with a cantaloupe plant, several jalapeño peppers, some zucchini, and a few marigolds to help ward off pesky bunnies and squirrels, (and my dad – it is the South side after all) I started my very first garden. I still don’t like the dirt, but I’m excited for my crops to grow! Another Friday night dinner in the Chi. That took me an hour to get to. That I did not have to pay for. This time I have leftovers. I need to google: how to have more energy. Maybe Frasier will give me some of his. No dog should bound around as much as he does. But every old dog should be as young as he is. Rosebud on Rush. Check it out. Yesterday afternoon as I was pulling out of the parking lot at work, I spotted two tiny gray pit bull puppies, and couldn’t help myself from ogling their tiny, wiggling bodies bounding down the sidewalk. When I decided to roll down my window and admire them some more, which in retrospect could have been slightly dangerous given the decidedly thug-ish men who seemed to be the puppies’ owners (sorry I’m not sorry for stereotyping), I couldn’t help but think they would make the perfect friends for Frasier. And then one of the owners offered the pups to me for $100 a piece. For a split second I considered it, knowing that the aforementioned thug-like men were probably going to sell the little pooches anyways, effectively making them doggie slaves in the evil world of dog fighting. 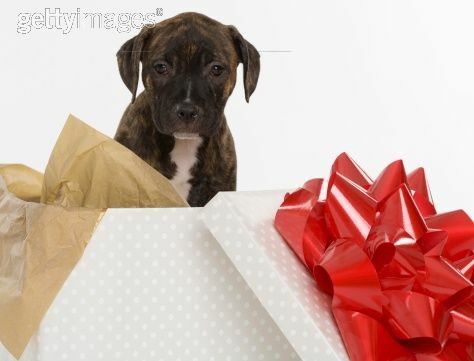 Again, sorry I’m not sorry for stereotyping; it’s your fault, Michael Vick. Either way, I hope the little guys end up in a good home. Sometimes when you’re hungry you just want to eat something RIGHT. NOW. And sometimes you’re kind of craving fast food, but you don’t really want McDonald’s or Subway, so instead you opt for Portillo’s. Or, if you’re from Wisconsin where all they have is Culver’s, you mispronounce it and call it Por-tee-los. It happens. And today was one of those days. 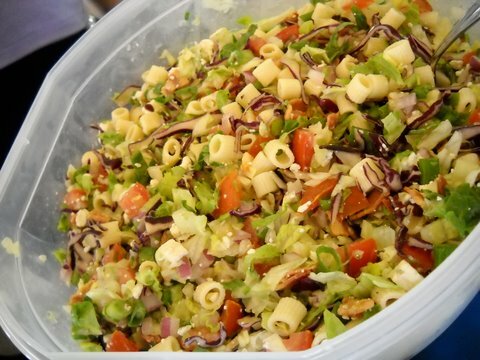 Somehow, the chopped salad from Portillo’s always seems to satisfy the hunger pains. What’s your go-to fast food? 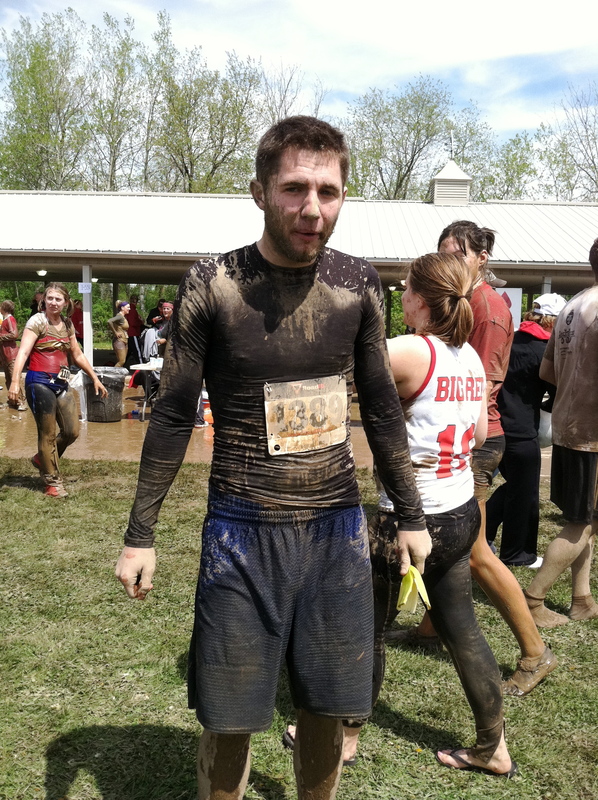 This past weekend, I attended what is known as a mud run. 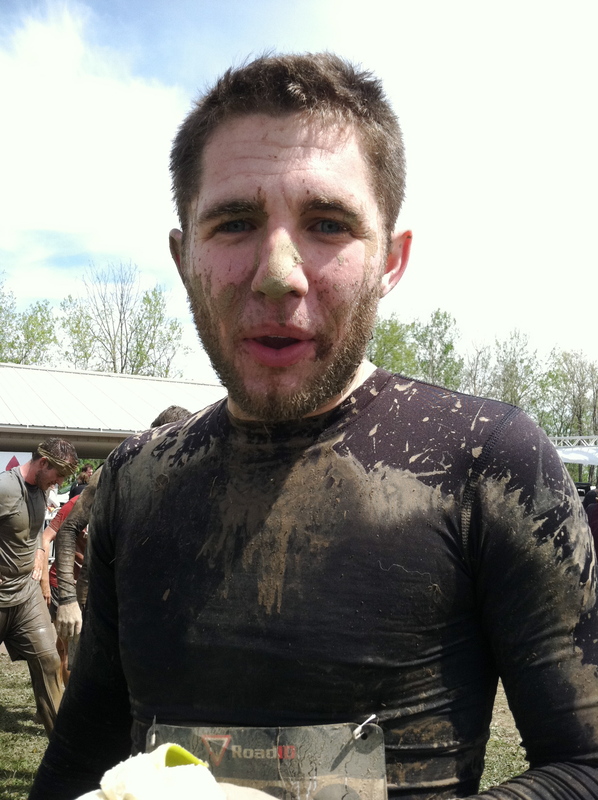 People all across Southern Wisconsin wake up extremely early on a Sunday morning, don their crappiest workout clothes and proceed to run through five miles of obstacle course nonsense, followed by a mad dash through nasty, cold, sopping wet mud. He will probs kill me for posting this. And yet, the Madison Mud Run of 2011 saw over 1,000 participants. Must be a Wisconsin thing. Ha, kidding. Sort of. Either way, I was witness to this whole event and despite my early morning grumblings and crabby attitude due to the cold and wind, I still have to give credit to all those who participated; especially because I know I will never be one of them. 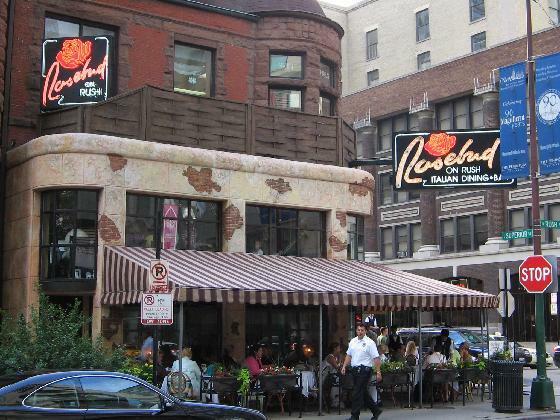 On Friday, I trekked from the Chicago Lawn neighborhood all the way North to Ravenswood (as mentioned here) to meet some family for pizza at a charming little place called Spacca Napoli. My uncle who lives in Portland was in town so it was a real treat to get to see him and everyone else, except for my dad who was lame and stayed in; which resulted in a hilarious little texting match between him and my aunt. 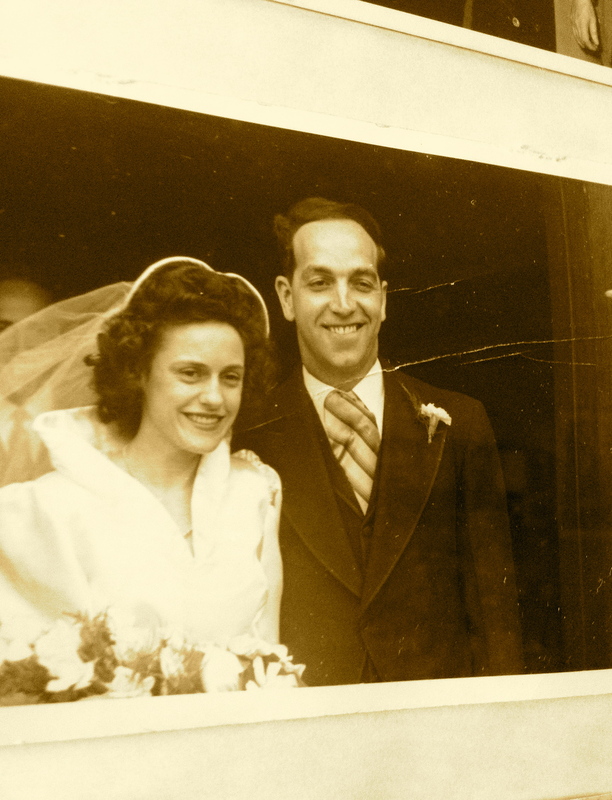 It was probably my cousin, however, who stole the spotlight, per usual, (Prodigal Son – am I right, Kel?) when my aunt called him out for being just a little bit tips. Even better, I discovered this charming place across the street from the restaurant, called Urban Pooch. Sounds like my kind of place. I’m not so sure Frasier would fit in, though. 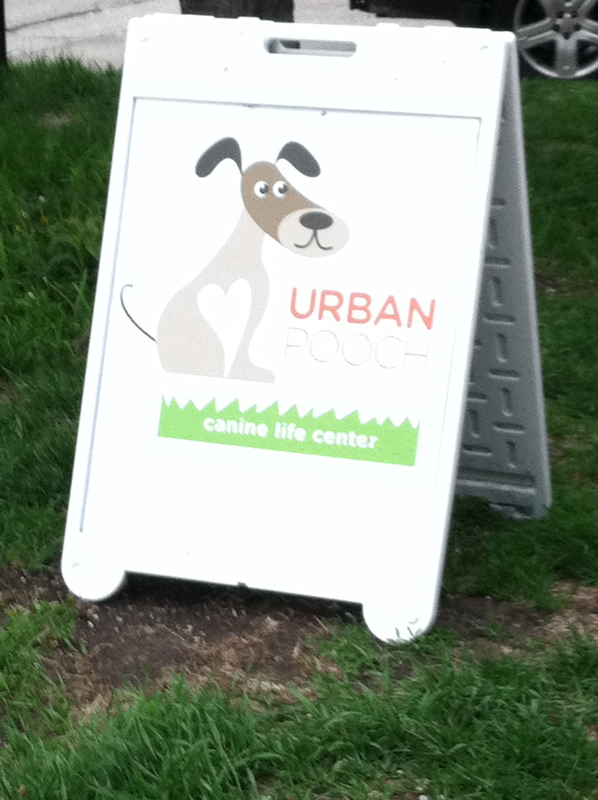 A canine life center; doubtful Frasier would fit in.